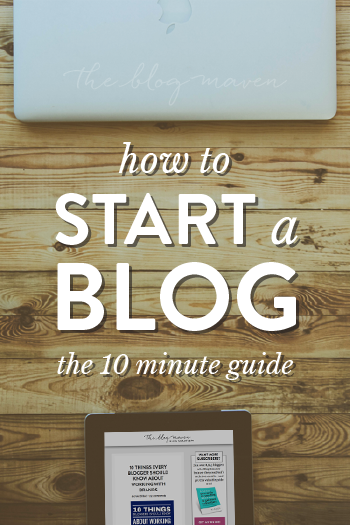 Are you ready to start your blog, but the only thing holding you back is knowing how to start it? 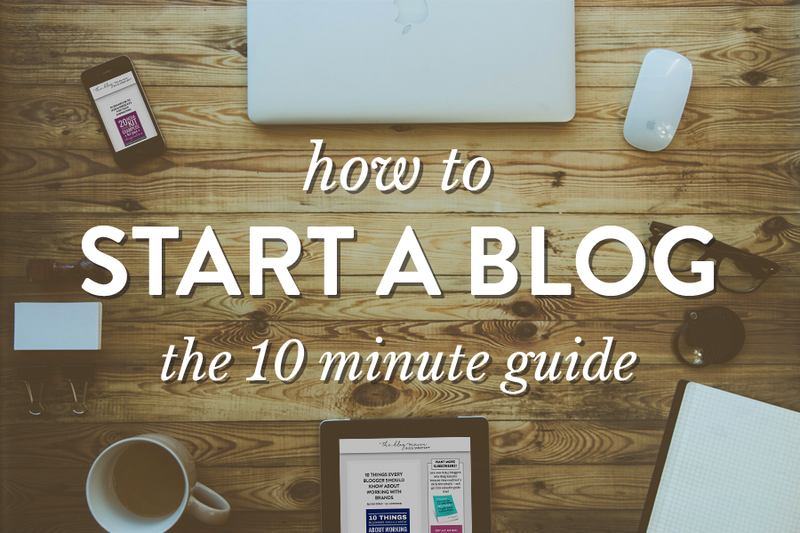 This quick guide will take you, step by step, through starting a blog – from installing your new site to getting your blog configured. If you follow each step, you’ll be up and running in as little as 10 minutes! A few quick details to go over before you start clicking. While it’s possible to blog on a completely free platform (like Blogger), the real costs are hidden. You have less control over your design, you often don’t own the rights to your own images, and if you ever decide to upgrade and move to a more professional platform with more powerful tools for growing your blog, you’ll have to pay big bucks to have someone do it properly. Let’s just say…you get what you pay for. Start with a WordPress blog and you’ll save lots of time, frustration, and in the long run, yes, money. If you’re nervous about learning WordPress, don’t worry – I’ll introduce you to some super helpful resources in Part 2 of this tutorial where you can learn to your heart’s content. Now that we have that out of the way, let’s start a blog! Your hosting company is the place that stores and delivers the files for your site, and it’s one of the most important decisions you can make for your blog. A good hosting company will load your blog’s pages quickly, have excellent customer service (hopefully with a “live chat” feature during office hours), and will keep regular backups of your site just in case. I’ve done setup, troubleshooting, maintenance, or design for over 270 WordPress sites, and I’ve had a full range of experiences with hosting companies – from true excellence to total disaster. I now personally use and recommend the company below because not only does my site run lightning fast, but they have reasonable rates and their servers are configured specifically for WordPress. Plus, if you ever need help or support, they’re fantastic. To get started, click here to go to SiteGround and then click “Order Now.” Since you’re just starting out, their starter package will be a perfect fit. Order their “StartUp” plan if you’re a beginner. When the time comes and you need a higher level of service, you can just file a ticket and ask them to upgrade you – it’s that simple. If you don’t already have a domain name (aka “URL” or “dot com name”), this is where you’ll buy that. 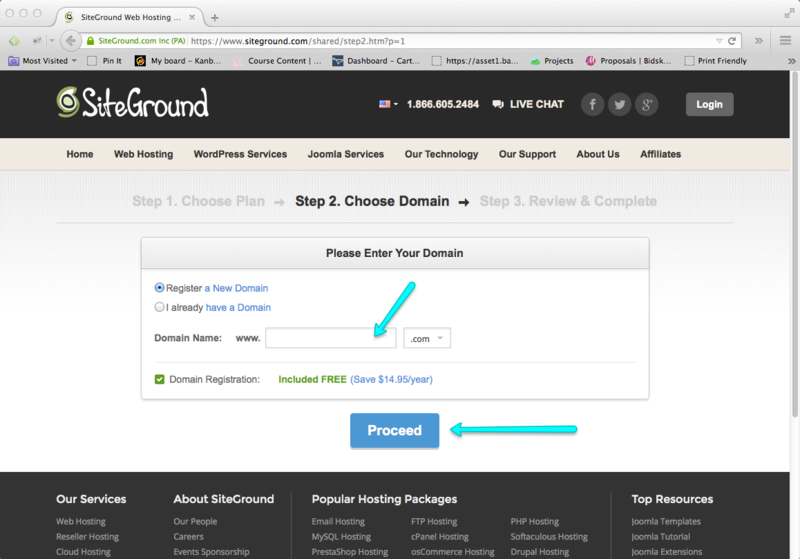 One reason to love this company is that domain names are free with them when you’re using them for hosting. Use keywords that are related to the topic you’ll be writing about. For example, if you write about crafts, brainstorm a list of words people might search for when looking for craft projects and incorporate at least one of those words. Avoid hyphens and variations of domain names that are already taken. And leave the kitschy misspellings of words at the door. You want to maximize people’s ability to verbally tell others about your site, and tricky domain names can get in the way. If at all possible, use a dot com name. Even though you could use .net, .org, or a whole list of other possibilities, many internet users still assume that .com is all that’s out there, and you risk losing traffic to the person who actually owns the .com version of your name. Keep your domain name as short as possible – not just because it’s more memorable, but being easy to type goes a long way, too. Don’t infringe on anyone’s copyright. For example, WendysFacebookTips.com will get you shut down in a heartbeat. If you’re not totally sure about what domain you want to use (maybe you’re not settled on a topic? ), the fallback is to use your own name. But if you go that route, make sure that you personally have a visible presence on your blog, and you give your readers every possible chance to get to know you. 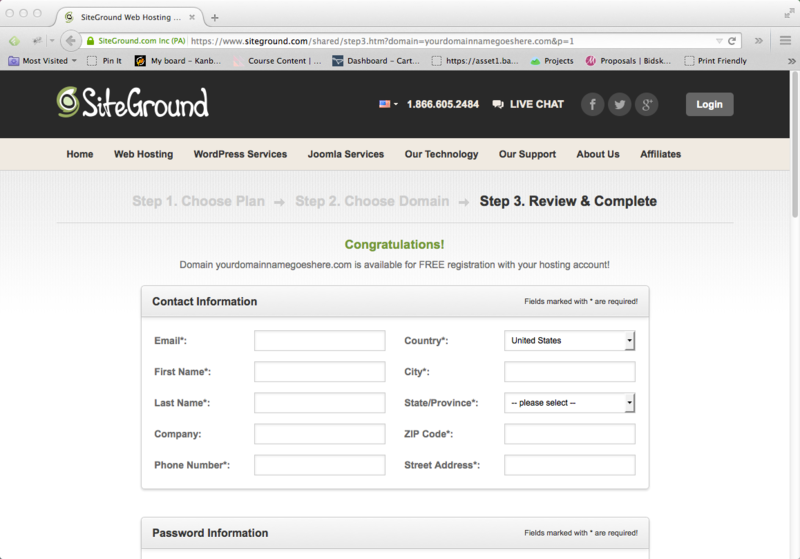 So for Step 2, enter your domain name and click Proceed. If you do already own a domain name (because you’ve purchased it through GoDaddy, eNom, or another registrar), then at the end of this tutorial you’ll visit your registrar to point the domain name here. Now you’ll just enter your personal details (name, address, etc.) and select a password for your account. It’s a good idea to use a strong password here – and don’t forget to write it down! This is where you’ll enter your billing details, as well. If you pay for a year in advance, setup is completely free. If you decide to just wait and “see how this blog thing goes” for a few months, they do offer another option for paying monthly, but you’ll have to buy your domain name separately. You can take a look and see whether the add-on packages are important to you. The only one I feel is a must is Domain Privacy. For $12/year, they’ll hide your personal contact information as the owner of your domain – which means less spam email for you (those spammers are vicious! ), and a much higher level of privacy. 5. 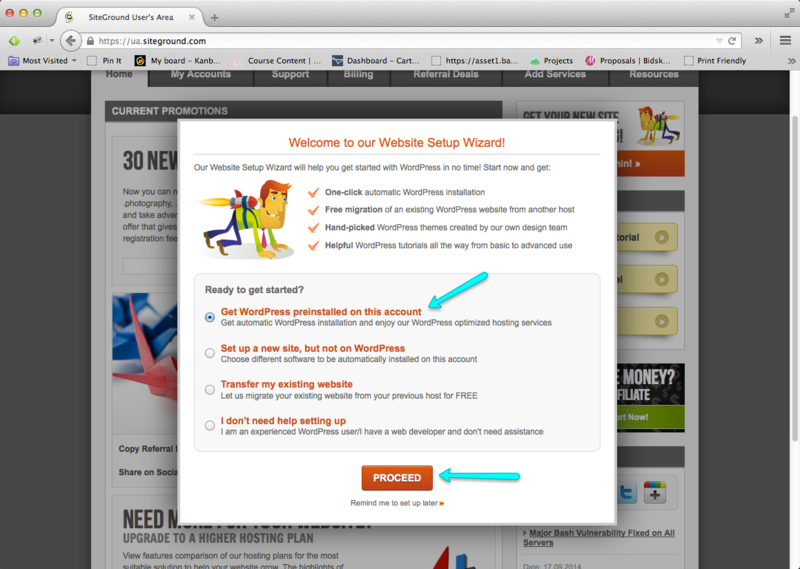 How to Start a Blog :: Submit Your Order…Success! When you submit your order, you’ll be taken to a waiting area for 10-ish seconds while they set up your account. 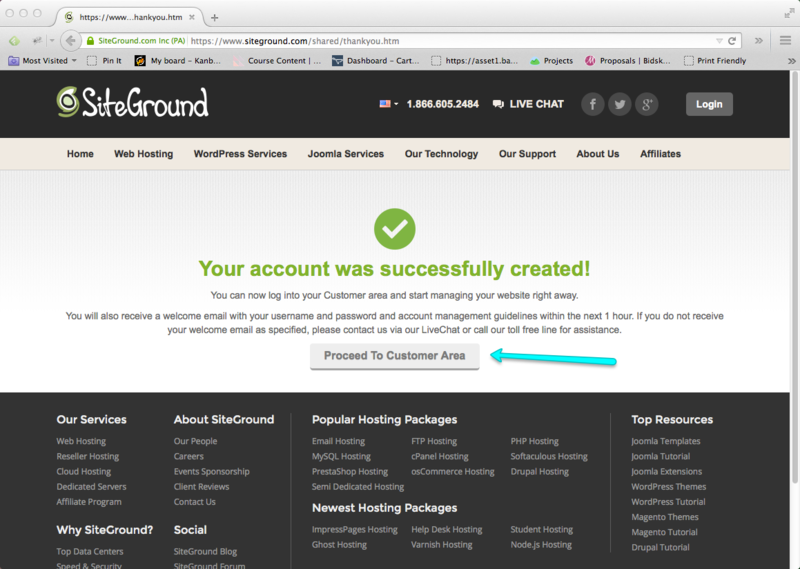 Then you’ll click Proceed to Customer Area, where they’ll lead you through installing WordPress. 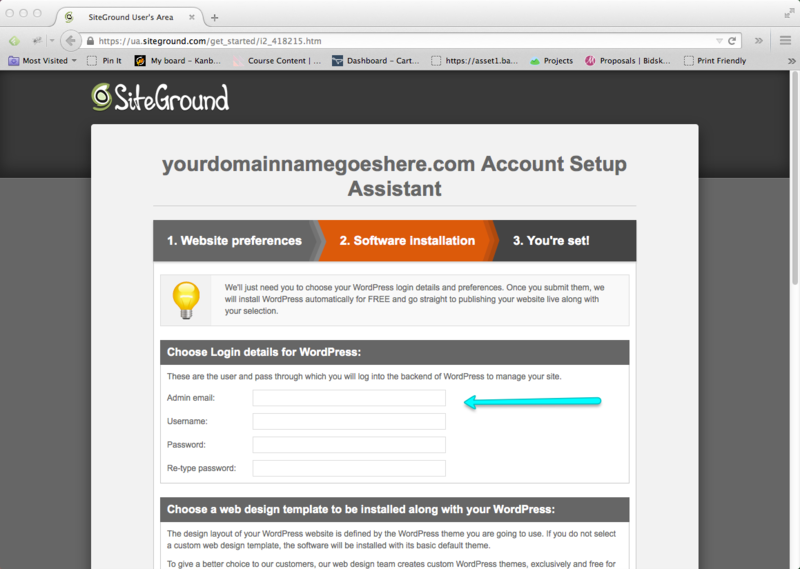 This is where SiteGround does the heavy lifting for you. Just select Get WordPress preinstalled on this account and then Proceed, and you’ll be taken to the next step. Enter whichever email address you want to use with your site, followed by a username and password. My recommendations? Don’t use “Admin” or “admin” as your username. It was an old practice by WordPress folks, but it leaves you open to potential hacking and malware on your site. Plus, you’re more creative than that. Choose a strong password, just like you would for your online banking access or your online mortgage payments. You’re going to be pouring lots of time and energy into this blog, and you want to protect it! 8. How to Start a Blog :: Finish! They’ll prompt you, at this point, to pick a design for your site – in WP speak, a “theme” or “template.” You can pick one if you wish, or just hit Submit. No need to worry about your design here; you’ll be able to take more time in a little while, during your blog’s setup, to weigh your options and make an informed choice on a theme that’s best for your blog. Here we have it! The URL of your new blog, with your username and password. Do yourself a favor and write that down. Copy your Admin URL (hint: it ends in /wp-login.php) and paste it into a new browser window…so you can head over to your new blog! If you already had a domain name you had purchased elsewhere, like GoDaddy, eNom, or another domain registrar, you’ll need to log in to that site to change your Domain Name Server (DNS) settings. The process for doing this varies from company to company, so contact your registrar if you need help. Make sure you have those on hand when you contact your registrar or log into their administrative panel. Once you update your DNS settings, registrars advise that it may take up to 72 hours for your new blog to show up at that URL…though in most cases it takes just a few hours. That will give you plenty of time to check out your different theme options for your blog’s design. 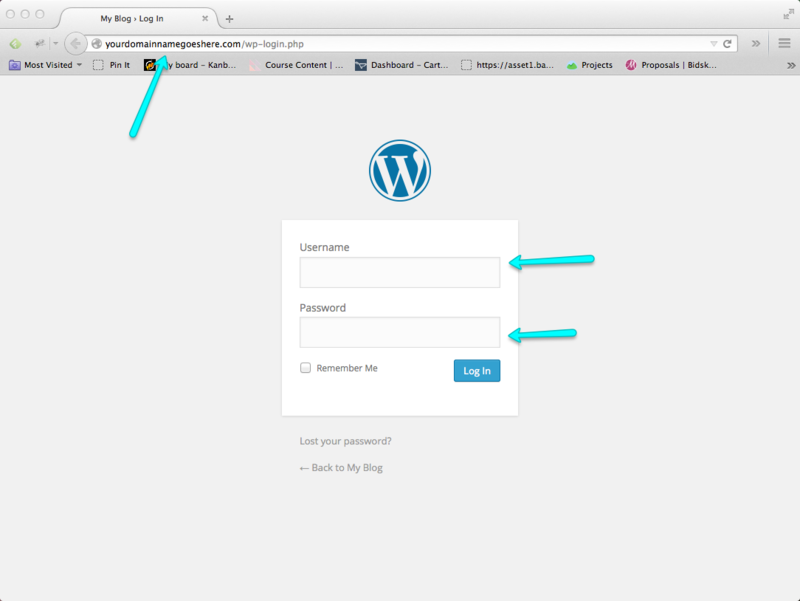 Paste your new blog’s admin URL into a new window, then enter the username and password you created. This will unlock the back end of your site, and VOILA! You’re in like Flynn. You didn’t think I’d just drop you off at the front door, did you? I have several more posts in this series to help you navigate your first steps in your new WordPress home. Would you do me a favor? If you’re finding this series helpful, please share it. Share it with your Facebook friends. By sharing this guide, you’re not only helping other people – you’re also supporting this site and allowing me to provide in-depth blogging knowledge completely free. Check out the rest of the posts in this series, below. I’ve got your back. Hi Jeni! I’m planning to start a blog and your information is quite possibly the best I have come upon. Thanks for all your hard work! Thanks, Paul – glad you’re finding it helpful. 🙂 Wishing you well in developing your new blog concept! what if you already started a free blog on wordpress but now you want to upgrade?Does this still apply or will you have to start completly over on a new site and lose your original one,and your followers? 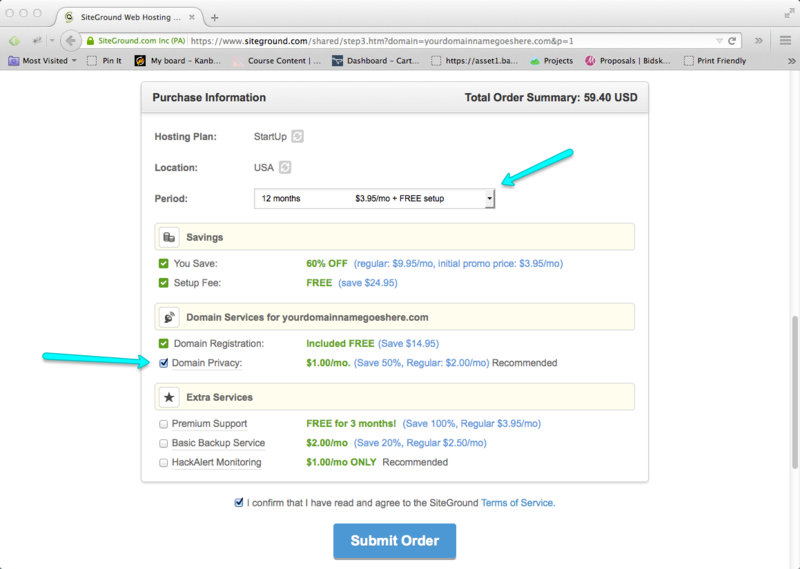 Hi Mama H, if you’re ready to move to self-hosted, you don’t have to lose everything you’ve already built. Yes, you’ll have to have a new design, but you can keep your old content and your followers. WPBeginner has a fantastic guide on how to do that, found here. Hope this helps! Thanks for providing this information. This site is demystifying all kinds of blog start-up questions for me. I’m so glad I found it! Extremely helpful info and easy to follow! But is the money I am using to pay for this site coming back to me at any point? I keep hearing bloggers usually generate a chunck of change for their blog, how so? Hi Lydia! Sorry I missed this when you posted it. Of course there are no guarantees on “getting your money back,” but it’s worth understanding your different options for monetizing your blog. 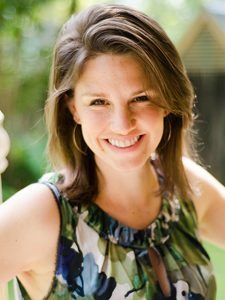 I don’t have a post specifically for beginners on making money, but Amy Lynn Andrews has a great one right here. Wishing you luck on your new adventure! Hi Jeni! Great info ..You’re such a big help and make complicated info easier to understand. I have a question about WordPress.. I’m trying to help someone move an existing Typepad Blog that started in ’08 to WordPress to expand content and monetize. So far it’s just been a blog with good content but no effort has been done to build it even though the potential is great. I may need some help moving it …Any advice you can give would be great….What do you think? Typepad to WordPress is notoriously difficult – my best advice would be to hire someone who has done it hundreds of times. 🙂 There are several services out there – you just have to google them. Hope this helps! Really a great post this is! I have set up my new WordPress blog recently. But I am not sure what to do next. Should I start writing right now or do some SEO related job first? This is a great post. I have launched my personal blog http://www.rickeysingh.com last week. I have developed it in Wix. Do you recommend moving it to WordPress? Thank you again for sharing valuable information. Awesome blog post just completed from zero to end. Thanks for sharing. This tutorial is great, well it started out that way. I got to step six and their set up is no longer as shown! The screen you show has to be found and clicked on and the options are completely different! I already paid and now I feel so confused and overwhelmed. Hopefully I can figure this out…. Yikes! Sounds like I need to update step #6. 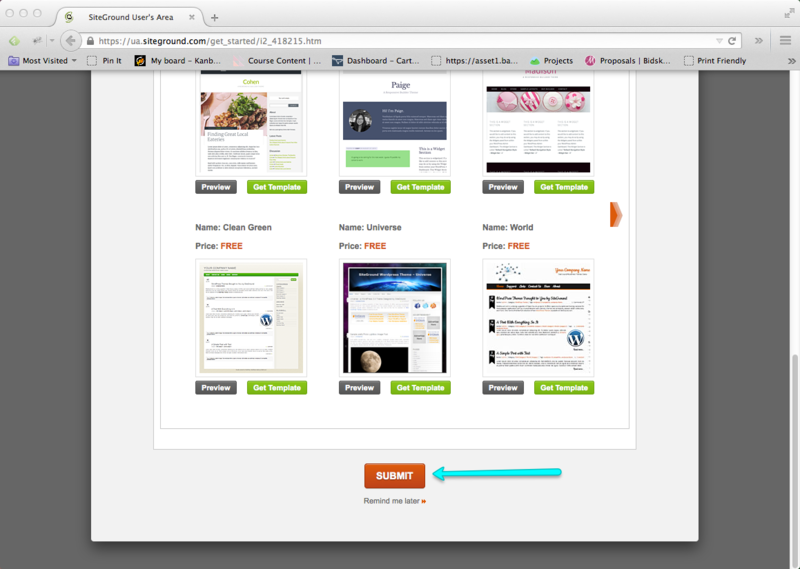 Try this: go to the “My Accounts” tab at the top of the page and find the orange “Go to cPanel” button. Click it and you’ll be taken to the cPanel, which is like your behind-the-scenes control area. 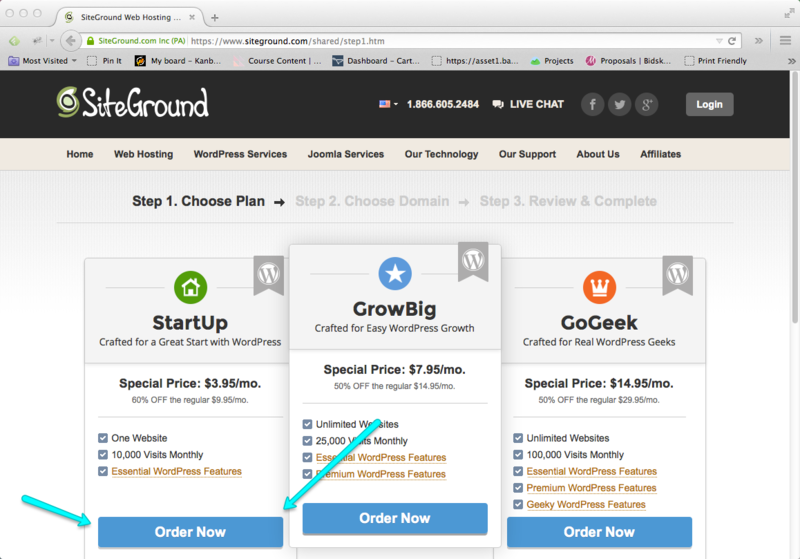 Find the “Autoinstallers” area (it has a gray heading) and click the WordPress icon. Then click the blue “Install” tab and you’ll see options for installing. …and if you get stuck, make sure you reach out to SiteGround’s support! They’re excellent, especially via live chat. Cheering you on, Alicia! Truth be told I completely panicked (“Oh no!!! don’t tell me I just paid and completely messed something up! or that it doesn’t work that way anymore! or….” BUT their support is AMAZING! I found the thing to ask them to install it, submitted a support ticket, and they had it set up within 20 minutes! So I’m already configuring my blog, installed the plugins you recommended, and am in the process of importing my old free wordpress blog over. Thanks for all you do! This is my first time I go to right here and I located so many interesting stuff for your blog. Thank you. Great post! We run an adventure travel blog… I think the most important thing we tell people is to travel with a purpose, Do not just wander around the world aimlessly. (Like ours is to experience and document the Top 100 Travel Adventures) So many travel blogs do not really have a purpose or a niche. Niche is key and many miss out on that because they want to cover and do it all. Do not just start a blog because you think you will get rich quick and be able to travel the world. It takes a lot of work and lots of time. Thanks for this post! I recently just launched my blog http://www.coloringthemap.com using your directions! 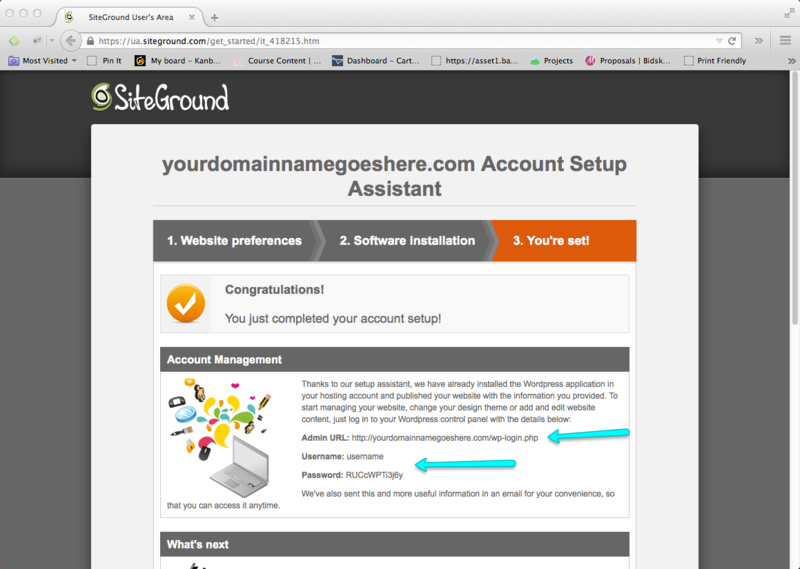 Love siteground so far – I have found it very easy to navigate. Thanks for the help! Is it possible to continue on blogger till you generate enough readership and then move to a paid platform ? I do have the domain but my website cannot have any drop down menus so I’m always thinking about whether or not to make the switch. YES, it’s absolutely okay to start a blog on a free platform until you have a plan for making money. The one caveat I’d give: make sure you’re building your email list (for subscribers) with a third party service (MailChimp is free up to a certain number of subscribers). That way, when you move, you’ll be able to easily take your subscribers with you and won’t have to start from scratch. I was confused when I first opened my blog. Now, I am lucky to see your post which is very helpful to me. Thank you. I’m confused. I have a website and a blogger blog. I want to move over to a self hosted WordPress blog. I already have a domain name, but that is for my website. Do I have to take out a new domain name to make the new blog? 2. Create a WordPress blog on a subdirectory. That means http://www.yourdomain.com/blog (where “blog” is where WordPress is installed). 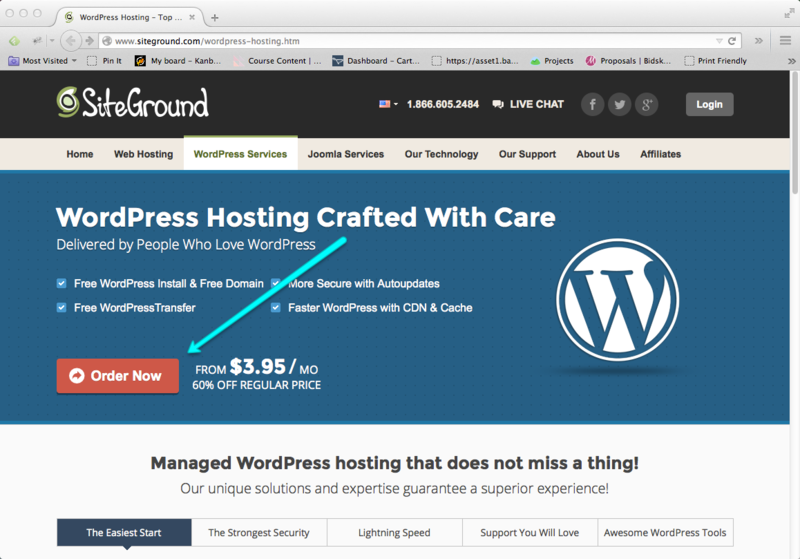 Your website host can help you install WordPress on a subdirectory. And you can always get tech help if you need it — I recommend Gretchen Louise at gretchenlouise.com. If you want your blog’s SEO to count toward your main website, you’d want to go the subdirectory route (#2).